WELCOME TO THIS MONTH’S AMAZING SHOWPIECE! This month it is this superb fully signed BRAZIL FLAG recently signed for us in person at the Leicester City new stadium where BRAZIL played in a triangular weekend competition. AUTHENTICATED WITH A GOLD BOND LIFETIME GUARANTEE CERTIFICATE! 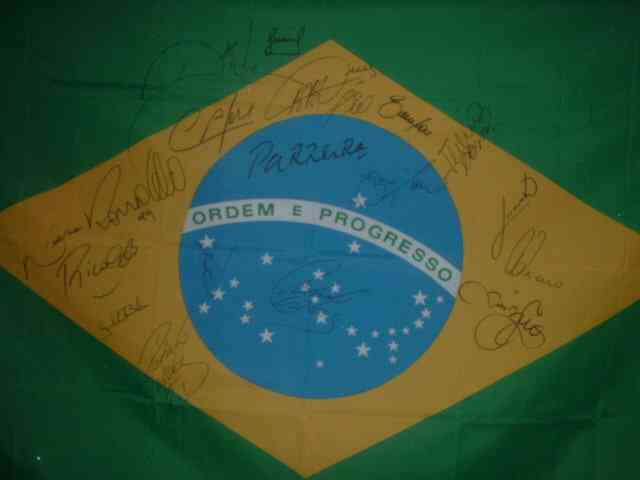 SIZE:- 6FT X 4FT RARE FULLY SIGNED BRAZIL FLAG. YES!! FULLY SIGNED BY 19 PLAYERS AND RONALDO WITH THE R9 ALSO ROBERTO CARLOS X2!FULL SQUAD DETAILS ARE DIDA, CAFU, LUCIO, ROQUE JR, ROBERTO CARLOS, KAKA, GILBERTO SILVA, ZE ROBERTO, RIVALDO, RONALDO R9, EDMILSON, JUNINHO PERNAMBUCANO, JININHO PAULISTA, ADRIANO, JUNIOR, JULIO CESAR, BELLETTI AND DENILSON.